This sight word game is played with 2 or more players. 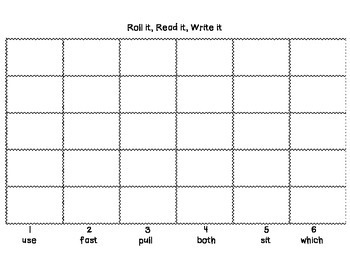 Players take turns rolling a die, reading, and writing sight words. 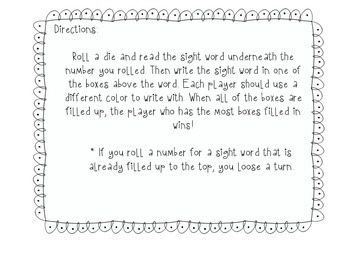 Directions: Roll the die and read the sight word underneath the number you rolled.Then write the sight word in one of the boxes above the word. Each player should use a different color to write with. When all the boxes are filled up, the player with the most boxes filled in wins! Includes 11 game boards. 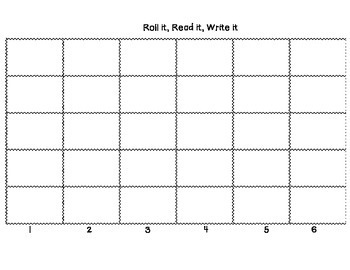 Also includes a blank game board where teacher or students can write in words to use to play the game. 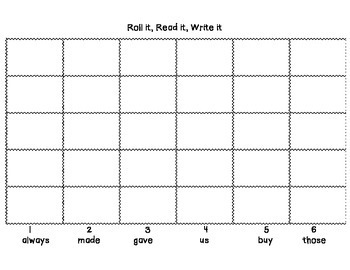 This is helpful if you are studying specific sight words each week.